The Book Industry Charitable Foundation (Binc) is accepting applications from eligible bookstore employees, bookstore owners, former Borders employees, and dependents of each for the Binc Scholarship program, which will award up to 35 higher education awards totaling $100,000. The scholarships are for full- or part-time study for the 2013 – 2014 academic year at an accredited institution of the student’s choice. The deadline to apply is April 18. The Binc scholarship program extends to all current employees and owners of retail bookstores in the U.S. and their dependents who have a minimum of one year of continuous employment at the bookstore. The bookstore must have a bricks-and-mortar presence in the U.S. and a substantial portion of the store’s revenue must come from the sale of books. Eligible employees must be employed directly by the bookstore. Up to 30 Binc Scholar Awards of $2,500 each and up to five Binc Honor Scholar Awards of $5,000 each will be awarded. To date, the program has supported the educational goals of almost 500 recipients with more than $1.1 million in awards. The evaluation process for the 2013 program will look at financial need, prior academic success, leadership capabilities, participation in school and community activities, work experience, and career aspirations. Booksellers and their dependents who are interested in applying should visit scholarshipamerica.org/binc for full details and to register. Today the Department of Justice filed a lawsuit against Macmillan's US trade publishing operation, charging us with collusion in the implementation of the agency model for e-book pricing. The charge is civil, not criminal. Let me start by saying that Macmillan did not act illegally. Macmillan did not collude. We have been in discussions with the Department of Justice for months. It is always better if possible to settle these matters before a case is brought. The costs of continuing--in time, distraction, and expense-- are truly daunting. It is also hard to settle a lawsuit when you know you have done no wrong. The government's charge is that Macmillan's CEO colluded with other CEO's in changing to the agency model. I am Macmillan's CEO and I made the decision to move Macmillan to the agency model. After days of thought and worry, I made the decision on January 22nd, 2010 a little after 4:00 AM, on an exercise bike in my basement. It remains the loneliest decision I have ever made, and I see no reason to go back on it now. I hope you will agree with our stance, and with Scott Turow, the president of the Author's Guild, who stated, "The irony of this bites hard: our government may be on the verge of killing real competition in order to save the appearance of competition. This would be tragic for all of us who value books and the culture they support". Today's DOJ filing is baffling. Following the implementation of the agency model at the end of 2010, the ebook market has become more competitive," said ABA CEO Oren Teicher. "There is more -- not less -- competition among retailers, and more -- not fewer -- examples of marketing and promotional efforts among publishers that have reduced prices. For the Department of Justice to challenge a business model that played an essential role in fostering a more competitive, diverse retail environment seems to turn logic on its head and is not in the best interest of consumers. While it's not yet clear what the full implications are of the legal action announced today by the DOJ with regard to publishers' pricing models for e-books, we believe one fact is very clear: There is nothing inherently illegal about the agency model, and -- as ABA has strongly said in the past -- we believe that fostering a more competitive environment is in the long term best interests of readers and book buyers. The new phone number for SIBA is 803.994.9530. The current fax number for SIBA is: 309.410.0211. The previous numbers will work for a short time. Please welcome Debbie Burleson, our new Retail Territory Manager who joins Charles Greiner in serving booksellers in the South. Debbie began her career with Baker & Taylor as a Marketing Brand Manager, managing independent studios and placing independent product into the Retail, CDF and Library markets until her departure in 2005. Debbie has since been an account executive with Ingram Digital Group, where she sold ebooks and electronic content into the higher academic market, before rejoining Baker & Taylor in the capacity of Retail Territory Manager. Debbie will provide sales support to bookstores in Alabama, Arizona, DC, Florida, Georgia, Louisiana, Mississippi, North Carolina, South Carolina, Tennessee, Virginia and West Virginia. 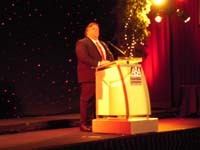 ABA CEO Avin Mark Domnitz announces the launch of IndieBound. In the spirit of the Boston Tea Party, booksellers declared a new era of Independents at Thursday night's Celebration of Bookselling, sponsored by Ingram Book Company/Ingram Publisher Services. The American Booksellers Association -- building on a rising tide of localism -- launched its new program, IndieBound, to enthusiastic applause in an SRO ballroom. The program is designed to unite booksellers, readers, indie retailers, local business alliances, and others in support of local activism and local economies and to lead an Independent Revolution. ABA CEO Avin Mark Domnitz told the hundreds of attendees that "the times -- they are a-changin'" and the moment is right for a program centered on localism. "America has clearly reached a tipping point -- the big store on the highway doesn't do it anymore ... as [shoppers] are turning to the people in their communities -- they are turning to people who believe the same things they believe in."